I am SO happy its the weekend. Seriously. I have to resist the urge to make a paper chain count down for the weekend, weekly. We are always grilling in the summer, especially in the summer time. 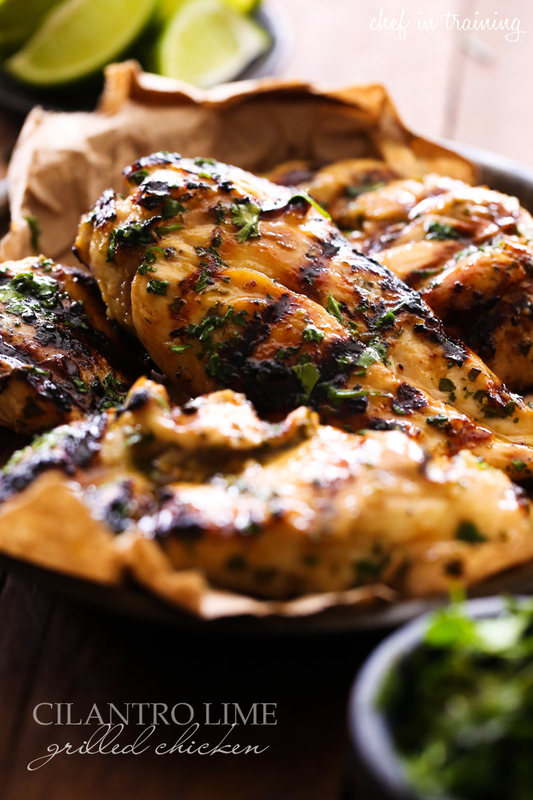 The Cilantro, Lime and Honey flavors make this chicken very fresh and tasty! The flavor is subtle, not overbearing. It is sweet and citrusy all at the same time! I love cilantro and the flavor really adds something special to the marinade. This chicken is sweet, citrusy and has a refreshing taste! It is sure to be a hit on the grill! In a Ziploc bag, combine lime juice, Cayenne pepper, salt, honey, oil, and cilantro. Seal tight and shake until well combined. Add chicken and marinate for 3 to 4 hours, or over-night. 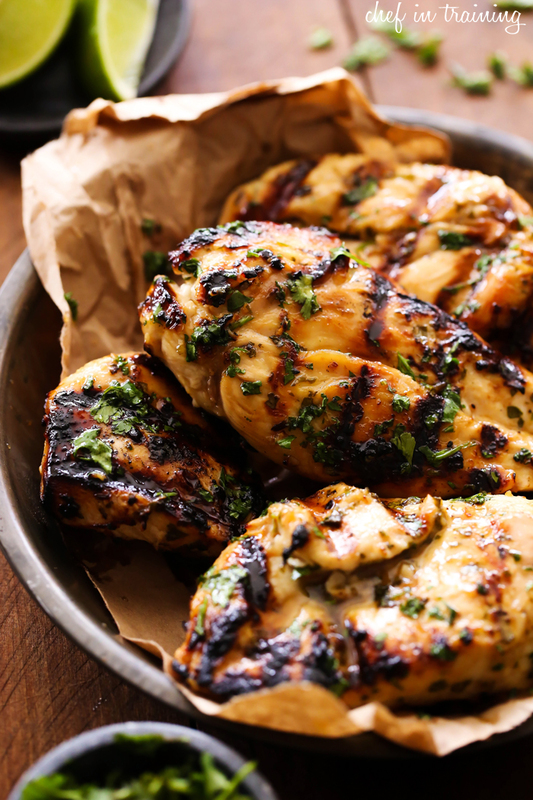 Grilled chicken never looked better! Hi Nikki, how much chicken for this amount of marinade/sauce? And, if chicken breasts, boneless/skinless or with skin still on?? Thanks, I love all your recipes and so does my family. What if you don't like or want cayenne pepper? Is there a different substitute instead or maybe reducing the amount of cayenne without changing the taste of the recipe? Really would love to make this but without the cayenne or maybe a reduced amount. Hi thank you for the receipe. May I ask what is Cilantro? If one does not have it what is the other option? I've made this twice now and love how fresh it tastes. There is no salt our pepper in the recipe. Does it not need it? I just made this, about a day after stumbling on the recipe. WOW. I am blown away by how delicious this is! I wish I prepared more, I can only imagine how this tastes next day. My only change was sprinkling a tiny bit of cayenne in the glaze as well. To accompany it I made Spanish rice, jasmine rice with sazon seasoning, with some salsa I had left over from Tin Lizzy's, and salt and pepper. Thanks for sharing, there is a new staple in this household! Would maple syrup work instead of honey? How much chicken could this marinade & what temperature would be required to cook in an oven & how long. Cannot wait to try! My chicken is marinating overnight as we speak, I can't wait to try it. I even shared the recipe with my newly wed daughter! Just looking over the ingredients and I can't help but notice that "chicken" is not on the list. Although it might seem obvious -- given the title of the recipe -- it would be helpful to know the quantity recommended for this recipe, also whether it is all white (breasts), all dark (thighs / legs) or doesn't matter, also boneless / skinless, or bone-in, skin-on. Thanks very much. so sorry that i didn't add that. It is fixed to now say 5-6 chicken breasts :) Thanks for letting me know! What type of oil do you usually use? Thank you! I love your recipes! Can this chicken be baked? I have ten people coming over on Sunday and I would like to make this recipe but I think it would be easier on me to bake this instead of grilling. If so, what temp should I cook it at and for how long? I'm always afraid of under or over cooking chicken and there's even more pressure when having guests! Thanks again!